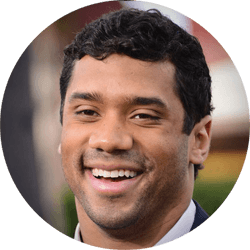 Russell Carrington Wilson was born on November 29, 1988 in Cincinnati, Ohio. He played college football for the University of Wisconsin during the 2011 season, in which he led his team to a Big Ten title and the 2012 Rose Bowl. He was selected by the Seahawks with the 75th overall pick of the 2012 NFL Draft. The following year, Wilson was named the Pepsi NFL Rookie of the Year. In 2013, he led the Seahawks to its first ever Super Bowl victory against the Denver Broncos. Wilson again led the Seahawks to their second Super Bowl appearance in 2014.